After several months of discussions with the Burghclere Parish Council, agreement has been reached to start constructing the Burghclere Miniature Railway. You can see from the aerial photograph the proposed layout of the track and station buildings etc. This new project is very exciting for Burghclere and one of its principal aims is to bring a new interest to the village and Sports Club. We are hoping to attract as many people as possible to become involved and assist with the project. A well-attended “open evening” was held last night, to allow local people to come along and learn more about the plans for the Burghclere Miniature Railway. Chairman Andy Timbrell presented the plans, as agreed recently, by the Parish Council. We had multiple offers of help with the building of the railway and we were able to outline how it is intended to fund the railway and commence with construction. It was important to highlight the purpose of the railway, which is to provide a lasting community facility, that will in time provide a new revenue stream for the Burghclere Sports club. This will aid with the upkeep and repairs required and hopefully provide a big boost to club membership. Finances were discussed and the railway’s aim is to be completely self-funding – To fund this project we will be offering the opportunity for the public or businesses to sponsor a metre or multiples of track, with your own personalised brass plaque identifying the section of track you have sponsored! Thereby you really can own a part of the community railway! Call Andy or Rob on the numbers below for more details. If you would like to be part of this project or talk to the team, we have a club night every Wednesday at the Sports Club from 6:00pm. You can track progress on the development of the Miniature Railway in this magazine and on our Facebook page @BMRSociety. If any individuals or local businesses would like to talk to someone regarding possible sponsorship. Please call either Andy Timbrell on 07411 351456 or Rob Moss on 07880 700030, alternatively go to The Good Exchange where you can sponsor the project on our fundraising page. 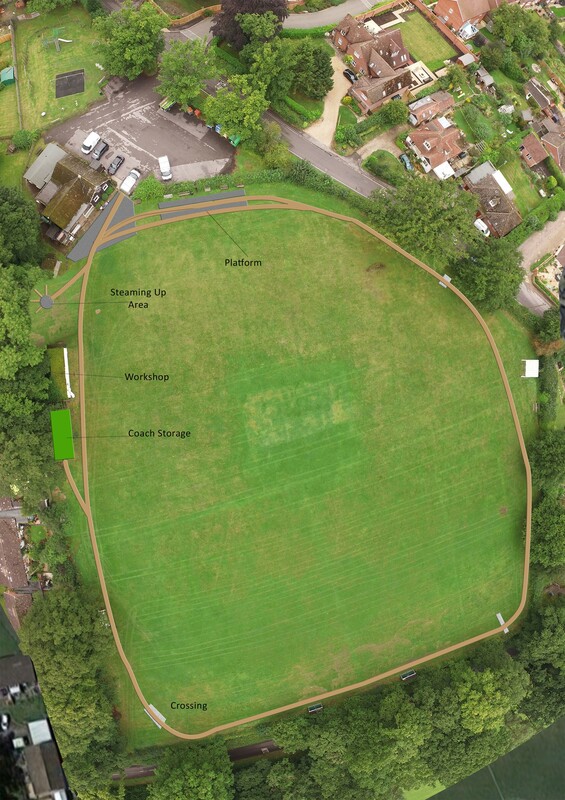 An aerial view of where the Miniature Railway track will run.